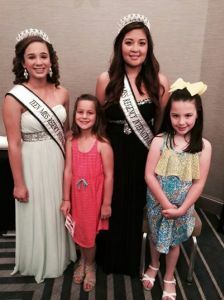 Saturday April 12, 2014 at the beautiful Royal Sonesta Hotel in Houston, Miss Regency International Erica Lynn Ramirez and Teen Miss Regency International Kayelyn Arambula were special guest. The Pirates & Princesses 2014 Children’s Fashion show and Luncheon, benefiting the children of Boys & Girls Harbor. The Boys and Girls Harbor was founded in 1947 severing children from ages 5 to 18 years of age, due to abandonment, neglect, abuse or family hardships. Providing them with a loving family environment regardless of their race or financial status. They have eleven residential cottages staffed by house parents that the children live with; many of the house parents have children of their own. In addition to the living quarters they also have recreational areas, playing fields as well as a working farm. The fashion show was coordinated by Premiere Promotions owner Stephanie Tallafuse. Stephanie asked Erica and Kayelyn if they would do a special autography signing and Photo session at a special luncheon for the children who were in the fashion show. There were special appearances in the fashion show by several of the children of the Harbor. Not only was Erica and Kayelyn greeting the children, celebritymodels Houston Texans QB Case Keenum, and Dynamo’starBrian Ching stopped by before hitting the runway. Before the Fashion Show and Luncheon was the Live Auction. These three auctions were very unique and very special. Live #1: BLACK AND WHITE BUNDLE. This was Elsa, an 11 week old black and white Shih Tzu, that had her very own create, bowl, bed, tote bag and even a pink tutu! 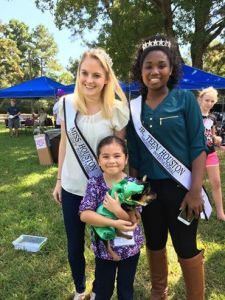 Miss Regency International wanted to take her home to join her two Shih Tzu, but someone else wanted her too! Live Auction #2: GETWAY MEXICO. This package was a seven night stay in a beautiful Estate in Cabo San Lucas. Live Auction#3: KICK UP YOUR HEELS. This was a shoe lover’s dream. Hector Villareal, owner of LUCHO provided 12 pair of shoes, one a month for a year. The fashion show, auction and luncheon would not have been possible without the generous support of the auction donors, fashion models, board of directors, and donors.